Easy, Honey Vanilla Peach Butter made with chia seeds. As I’ve mentioned previously, every year we vacation in the mountains of North Carolina; well the first year my hubby took me we stopped at a restaurant in North Georgia called the Dillard House. Oh the Dillard House! If you’ve never heard of it before, let me assure you they have serve some of the most amazing Southern food. It was three summers ago on our first trip that I fell in love with peach butter. 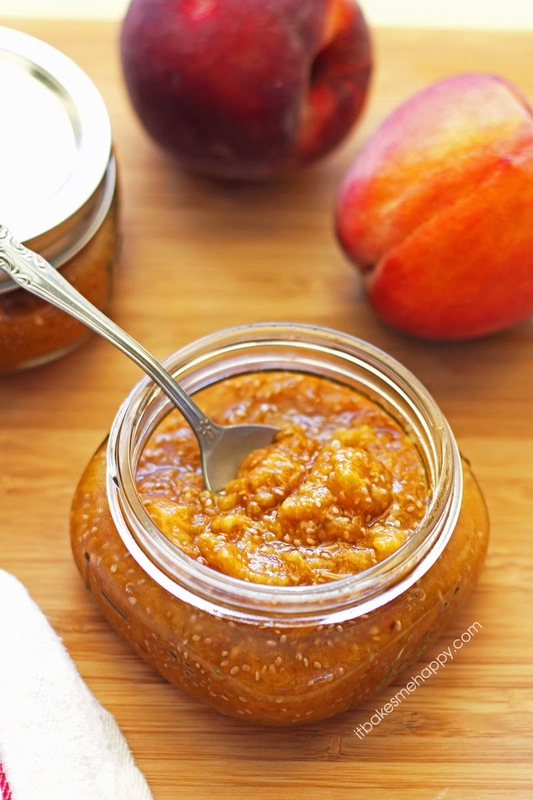 Peach butter isn’t like apple butter, it’s better! It’s smooth, velvety and bursting with fresh peach flavor, not muddled up with lots of spices to mask the fact that it’s been canned. Of course you can make your peach butter with spices if you like, but I’m a purist and I absolutely adore the un-spiced versions. Since my first taste of peach butter, I knew that I wanted to make my own and share it with you. Each summer I tell myself I’m going to do it and this year I finally did! I recently became obsessed with chia seeds and have be putting them in just about anything I can think of; smoothies, oatmeal, baked goods, ect. I did a little research and came across a plethora of chia jam recipes and decided to try my hand at creating a peach chia seed butter. I love this honey vanilla peach butter that is amped up with the addition of chia seeds, I’m spreading it on biscuits and toast, stirring it into my morning oatmeal and eating it by the spoonful when no ones looking. So head out to the market and then into the kitchen to whip yourself up a batch of this fruit butter, I hope you’ll enjoy it as much as I do! In a large saucepan cook the peaches, lemon juice and honey over medium heat for 20 minutes. Stir occasionally and mash the peaches with a wooden spoon as they soften. Add the chia seeds and cook an additional 5-10 minutes until the liquid is mostly absorbed and the seeds begin to gel. Cool in the pan 10 minutes, transfer to canning jars. At this point you can either can the peach butter for long storage or cool completely on the counter and then cover and refrigerate for up to 2 weeks.